Mansfield @ Bishop Feehan – Postponed to 4/23 at 4:00. Franklin, 3 vs. Bridgewater-Raynham, 2 – Final – Trailing 2-1 heading into the bottom of the seventh, the Panthers rallied for a pair of runs to walk off with a win against the Trojans. Jackie Cherry led the inning off with a single and courtesy runner Anna Balkus advanced to third on sacrifice bunt from Olivia Haba. Balkus came home to tie the game on a wild pitch. Rachel Cousineau drew a walk, Ally Shea singled and both advanced a base on a wild pitch. Olivia DiGiacomo then delivered the game-winning hit with a base hit. The Panthers scored their first run in the fifth inning when Cousineau knocked in Tara Hartnett (2-for-3), who led off with a double. Cherry earned her first career win in the circle for the Panthers. Mansfield, 27 @ Needham, 7 – Final (5 inn.) – Marissa Staffer had a pair of hits and seven RBI, as well as a strong defensive game, to lead the Hornets to a big non-league win. Milford, 8 @ Hopedale, 0 – Final – Milford rolled to its sixth straight win and second shutout of the season by blanking Hopedale. Senior Ali Atherton struck out 10 batters in a complete game effort, allowing just four hits to get the win. Shannon Cormier (3-for-4) and Emily Piergustavo (2-for-4, triple) each knocked in a pair of runs for the Scarlet Hawks. Kate Irwin went 3-for-5 with two runs scored and Jess Tomaso was 4-for-4 with a double and two walks for Milford. Foxboro, 8 vs. Catholic Memorial, 9 – Final – Foxboro scored five goals in the final quarter, cutting the deficit to one on back-to-back goals with less than a minute to play but saw its comeback bid come up just short. Trailing 7-3 to start the fourth, Brendan Tully (three goals, three assists) and Colin Spinney (two goals) scored consecutive goals to make it 8-6 with just over three minutes to go by CM answered with what turned out to be the game-winner right off the draw. Spinney and Tully scored back-to-back again to bring Foxboro within one with less than a minute to play but the Knights were able to run out the clock. Trey Guerini, Andrew Whalen and Louis Piccolo each scored once for Foxboro while Jake Addeche made 11 saves in net. Franklin, 9 vs. Masconomet, 5 – Final – Junior Eric Civetti netted a hat trick and had one assist while classmate Kyle McInery found the back of the net twice with one assist as Franklin rolled passed Masconomet. Senior Packie Watson scored twice to round off the Panthers’ attack. Junior Connor O’Rourke made 12 saves in net while sophomore Jacob Alexander lost just one face off all game, albeit due to a false start. Mansfield, 10 vs. Scituate, 9 – Final – In a back and forth affair, Mansfield rattled off three straight between the second and third quarters to pick up enough separation to beat Scituate. The teams traded goals for the entire first half, with the Sailors taking a brief 2-1 lead before Mansfield’s Sam O’Connell scored one of his four goals to tie the game. O’Connell scored just before half as well, taking a feed from Hunter Ferreira (two goals, three assists) to put the Hornets up 6-5 at the break. Aidan Sacco provided an assist to O’Connell and then scored himself to put Mansfield up 8-5 in the third. Sacco and Joe Cox scored in the fourth quarter. Scituate scored its ninth goal with two seconds to play to drqw within one. Mansfield goalie Sean Powers made 19 saves in net. Attleboro has developed as a program under head coach Mike Strachan and continues to be one of the teams contend with for the Kelley-Rex title even with a number of new faces on the roster heading into this fall. Even with the loss of standout lineman Kyle Murphy, the Bombardiers will have size on both sides of the ball and use that to control the line of scrimmage. Offensively, senior quarterback Tyler McGovern returns after an injury knocked him out of the starting lineup midway through last season. He gives Attleboro the chance to look downfield, while junior Cam Furtado stepped in at QB last year and proved to be a dynamic athlete who opened up defenses with his legs. The offense will flow behind senior lineman Andrew Gingras. At 6’5 and 285 pounds, Gingras will be counted on to open holes for senior running back Sam Corrado and also provide a stout run stopper on defense. Corrado will also provide help at linebacker and on special teams. “The 2016 Bombardiers are a young team with many players that will be competing for time both offensively and defensively,” said Strachan, who is confident that despite the youth on the roster that Attleboro will be a team to watch this fall. There is a lot of energy in the Franklin camp over the past couple of weeks, as new head coach Eian Bain takes over from longtime coach Brad Sidwell and looks to give the Panthers a boost after three straight one-win seasons in the Kelley-Rex division. Bain said that he expects there to be a “different vibe” from the team this season. The Panthers have a lot of experience coming back this season starting in the backfield with quarterbacks Jake Noviello (junior) and Alex Cregg (senior), who both saw action last season. Whoever is starting will have a host of experienced receivers to look for with Eddie Scannapieco, Packie Watson, and Joey Blasie on the outside and 6’5 Connor Peterson at tight end. The bulk of the offense will run through senior tailback Jacob Wolowacki, who emerged last year as a go-to back with three touchdown runs. Defensively, Franklin has a lot of talent returning in the back seven led by senior safety Jake Lyons, who will also help out as a running back on offense. The secondary also includes Kyle McInery and Nick Gordon with Justin O’Callahan, Bruce Johnson and Khyler Colella manning the linebacker positions. Brad Jarosz will add size to the defensive end position. King Philip got off to a rough start last season, but managed to turn things around with a dramatic victory at Mansfield and won three out of four to get back into the postseason. The Warriors could be inconsistent on the offensive side of the ball in 2015, but with experienced skill position players coming back KP could be ready to challenge for the league title. It begins in the backfield with senior quarterback John DeLuca, who is ready for his third year as the starter and is one of the toughest signal callers in the league. This season, DeLuca will have a number of weapons to help put points on the board. Senior running back Sean Garrity will add speed to the edge for the Warriors, while his classmate Giovanni Fernandez is a power back to add another dimension inside the red zone. Senior Michael Mello returns to add experience to the receiving corps. The strength of the Warriors under head coach Brian Lee has been defense and line play and this season should be no different. Seniors Paul Macrina, Michael Sullivan, and Daniel Loewen will be major factors on both sides of the ball. Senior Alex Olsen has the potential to be the defensive MVP this year taking over the role of graduated linebacker Cory Lombardo. Fernandez and fellow senior Brett Mazur will add strength to the linebacker position as well. Mansfield’s defense held teams to 15 or fewer points in all but two games last year. Only St. John’s Prep and Marshfield (two teams ranked in the top five in the state when they faced the Hornets) were able to get any rhythm going offensively against the Hornets. Despite strength on that side of the ball, Mansfield struggled to find consistency on offense and ended up one point short of a share of the Kelley-Rex division title. This season, the Hornets offense could be a huge strength with a number of playmakers returning. 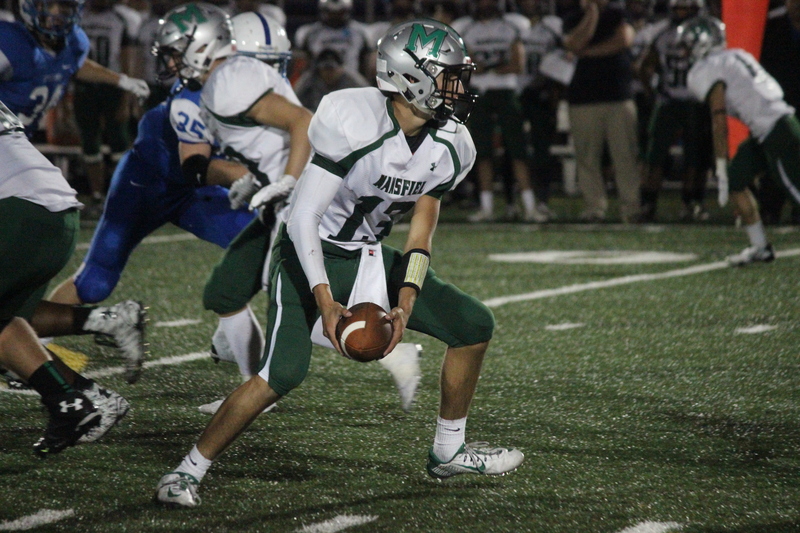 Senior quarterback Anthony DeGirolamo will be the starter for the second season in a row and will have a strong backfield around him with senior Brian Lynch as the power back and Nick Graham giving Mansfield speed to the edges. DeGirolamo will be able to aim for junior Hunter Ferreira, who has emerged as one of the top receivers in the league, and senior Ben Budwey. On defense, the front seven will once again be a strong feature for the Hornets. A.J. Gibbs, Colin Gibbons, and Andrew Ducharme add size and strength on both sides of the ball, while senior linebacker Travis Sjoberg is a leader with the potential for hitting triple digits in tackles this fall. Senior placekicker Diogo DeSousa is a weapon in special teams after being recognized at kicking camps over the summer. Oliver Ames head coach Mike Holland is entering his second season in charge of the Tigers and will also be managing the program’s first fall in the Kelley-Rex division. In the last three games of 2015, OA beat Norwell and North Quincy and battled Sharon in a three-point loss on Thanksgiving Day, building momentum heading into this season. The Tigers are excited about the potential of the offense with two quarterbacks who can make plays with their feet or their arms. Kyle Gagliardi and Travis Campbell are in the mix to be the starter and Holland expressed confidence in both of his seniors. OA also has a strong running game with senior Liston Funai leading the way for a group of backs that provide the Tigers with toughness and the ability to find open space. The Tigers have a new coaching staff this fall, but it will be one that is very familiar to fans of the Hockomock League. Brad Sidwell moved to Taunton after 20 years in charge of the Franklin program. Sidwell comes into his new position with plenty of experience in the league and an experienced roster that has 14 returning starters, but the Tigers enter 2016 without a Kelley-Rex win since 2012. There is optimism in the camp this preseason because of the large number of returning players and because of the size that Taunton boasts on the front line. Senior Zakim Harrow checks in at 6’2 and 335 pounds, his classmate Sylvester English is 6’1 and 290 pounds and junior Paul Carrao is 6’3 and 270 pounds. Those players will open holes on both sides of the ball and create space for playmakers such as senior linebacker Mike Fernandez and senior running back Brevan Walker. There is a battle for the quarterback position this season. Junior Collin Hunter threw 11 touchdown passes last fall but sophomore Noah Leonard has impressed in camp and could snag the starting spot for Friday night’s opener at New Bedford. Whoever is under center will have a couple of strong targets to aim for with senior receivers Adam McLaughlin and Sam Krajewski and senior tight end Andrew Wellington all back.